You read that correctly. 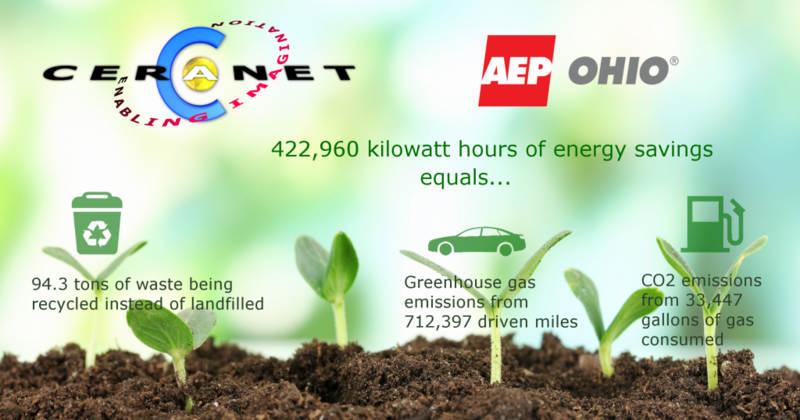 422,960 kilowatt hours of energy savings from just this one initiative in 2016! According to the United States Environmental Protection Agency this is equal to 297 tons of CO2 emissions OR 317,190 pounds of coal burned in a power plant. When you convert an old server that uses two large power supplies to a cloud server, you save energy + save money. Recent studies show that over 30% of servers running in a typical data center are zombies running unknown functions or no function at all. In addition, most servers run at 10-20% capacity. We accomplished the energy savings by working with clients over the past few months to upgrade their IT systems, eliminate waste, and convert old inefficient equipment to new high powered cloud servers. It’s that simple. CeraNet is constantly working with clients to help them ‘right size’ their IT resources and allow them to pay for only what they use. This helps them save time, money, eliminate initial capital outlay for servers and infrastructure, and provides an economical, high availability redundant ‘as a service’ IT model going forward. We also help clients with ongoing management and support services by contract or as needed. This gives them peace of mind knowing that we have experts on call 24/7/365. This power savings incentive award is being passed along to customers when they bring in new high efficient equipment to our data center OR when they use our GREEN Cloud Computing Services. Our goal is to double our efficiency program participation in 2019. 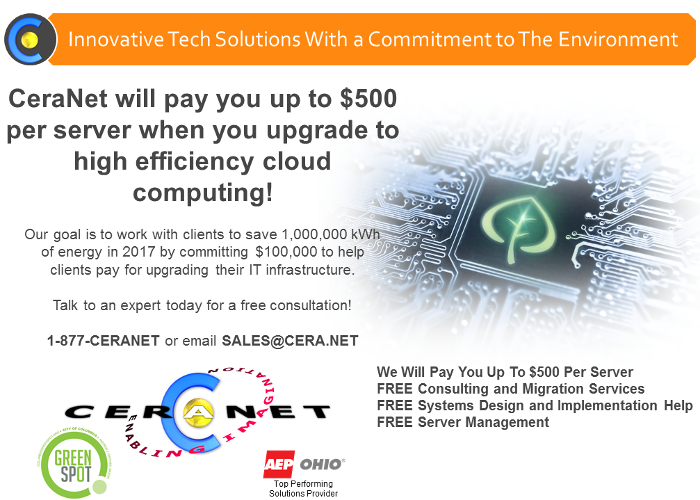 To jump start your technology upgrade, we will pay you up to $500 per server when you upgrade to a cloud server + free consulting with experts + free system design services with our experienced engineers. Contact Us for a free, no obligation consultation today!